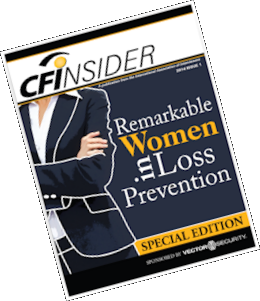 The International Association of Interviewers (IAI) has teamed up with Vector Security to recognize remarkable women in loss prevention through a special edition of the CFInsider, a publication of IAI. The group selected individuals who are well-rounded, tenured in their profession, value continuing education and are all-around excellent leaders in their organizations as well as the overall loss prevention field. "With only a small fraction of females at the highest ranking level of the loss prevention hierarchy, it's important to recognize stellar women in the field. By doing so, we hope to continue to attract other women into such an amazing industry full of opportunity," said Wayne Hoover, CFI, executive director for IAI. "We’re also proud to partner with Vector Security in this annual initiative to recognize these remarkable loss prevention professionals." Industry Commitment - Making time to get involved is a deep commitment. Our honorees are significantly involved in developing people and this industry by committing their time at industry events, associations and work groups. Dedication to Learning - It takes a confident person to admit they don’t know everything. Our honorees understand that life is a journey of learning and have an external commitment to learning, demonstrated by certifications, memberships and involvement. Leadership Qualities - IAI embraces the ancient concept of “servant leadership” and our honorees embody those qualities. One of the most important descriptions of a servant leader is gratitude. Career Journey - A career path can be as diverse as the individuals you meet along the way. Our honorees have taken different paths that provided valuable and unique lessons along the way. There is not one “right” career path, as our honorees clearly demonstrate. IAI will continue to recognize and honor remarkable women in the LP field each year by devoting a special edition of the CFInsider to them, as well as columns in their regular publication and dedicated space on their website, www.certifiedinterviewer.com. Congratulations to this year's Remarkable Women in Loss Prevention! Click here to read this Special Edition of CFInsider.